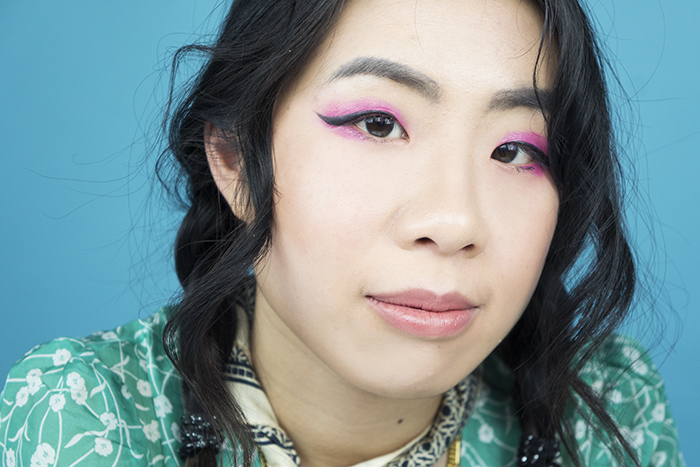 When it comes to makeup for monolids, there’s only so many smoky eyes and cat eyes one can take. Here, we dare you to venture outside your comfort level and try some daring new looks. Okay, so hear me out: If your eyelids are a canvas for your eyeliner, then double eyelids are a coloring book and monolids are a masterpiece. But if this is true (and it is! ), then why are so many monolid makeup tutorials out there so boring? Maybe it’s just me, but the world doesn’t need another subtle smokey monolid eye look video on Youtube. I want color! I want drama! I want something that means my life isn’t a meaningless bore just because I don’t have to capability to wake up and create a cool cut crease look. Almost every single eye makeup tutorial on the internet was created by and for people with double eyelids. This makes sense. Most people have double eyelids. Not to mention, they’re astoundingly easy to apply makeup on. There is a literal line that tells to how far to go and when to stop (a fact that shocked me the very first time I applied eyeshadow on another person). I couldn’t figure out how the world could be so unfair. How was this person blessed with the beauty genes and I wasn’t? They could probably just get up in the morning and use their fingers to fill in the handy little outline that had been pre-created for them. Meanwhile, I was in high school and still struggling with eyeliner that was probably an inch thick. 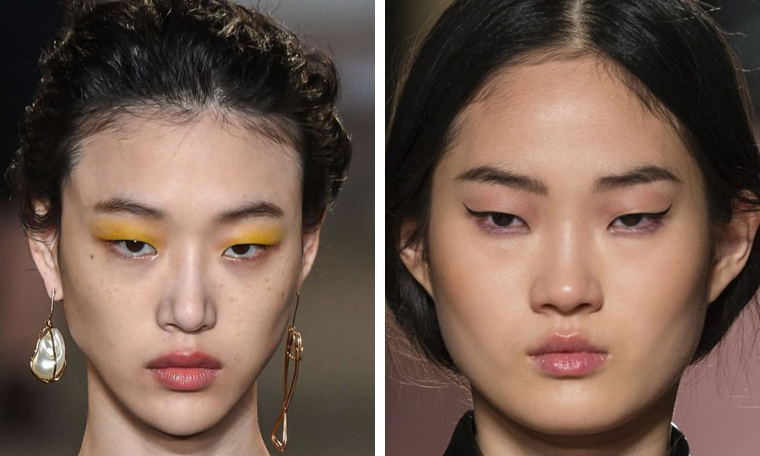 Monolids may never exist as a Western beauty standard, but the increase in Asian models on high fashion runways has opened a door for representation that has never existed before. 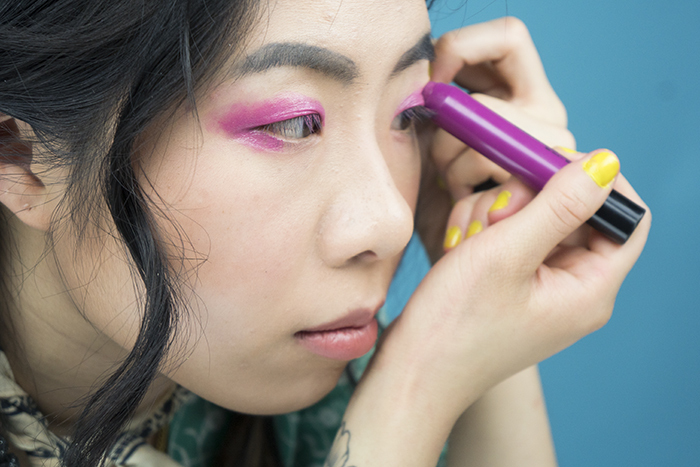 Here are some of my favorite tips and tricks to help you create fun colorful eye looks. But before we get started, be sure to remember that there’s actually a large variety of monolid shapes and what works for me may not work for you. So make sure to play around. 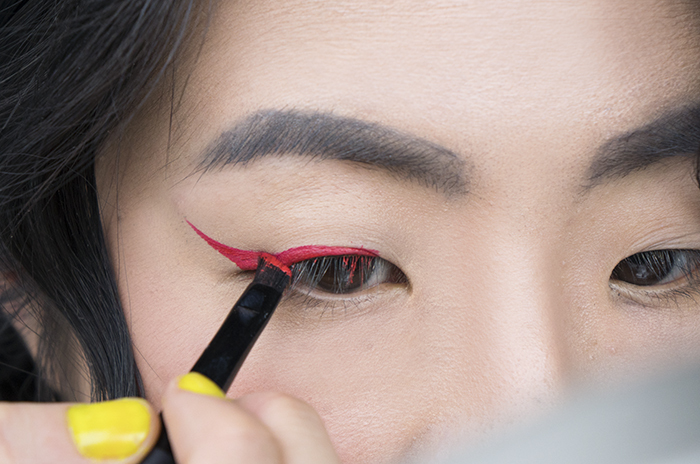 The more outrageous the eyeliner, the better! 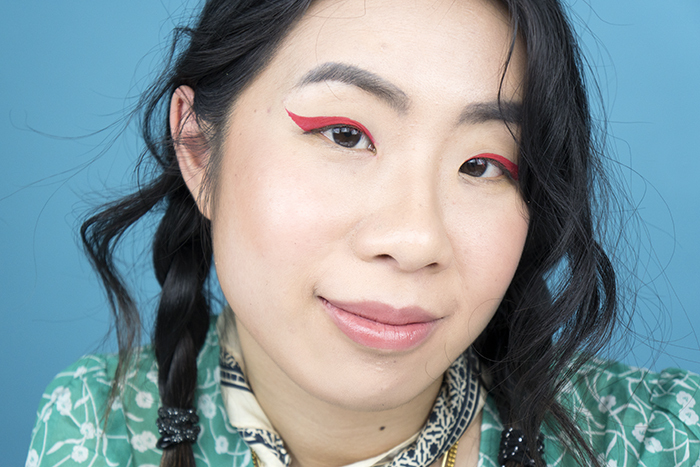 If you’re on Instagram you’ve probably seen a lot of cool Asian girls trying the extreme eyeliner look. There’s a reason for that. It looks super cool on monolids and you can draw it as big as you want. The longer the better. 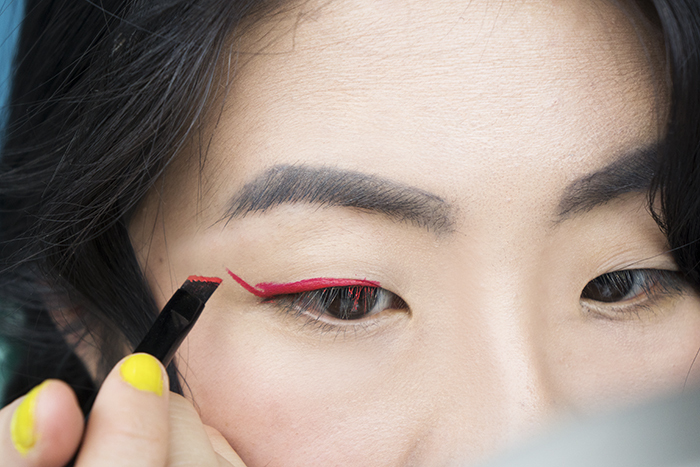 Eyeliner like this is my go-to look if I’m in hurry. I like the look of the elongated line because it lengthens my eyes and makes them look generally larger. 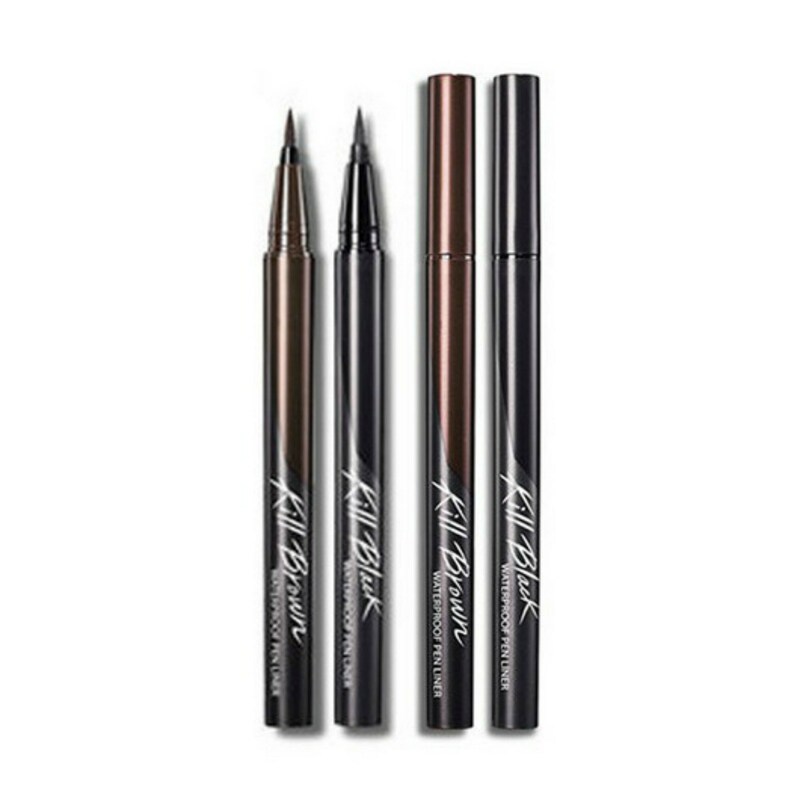 For winged liner I’m a big fan of liquid liner pens. My favorite is the Clio Waterproof Pen Liner because it’s so precise! If wings are something you’re having trouble with, creating a more intense wing can actually be helpful. The more precise you have to be the less room there is for error. So if you mess up, just extend the wing further. As a general rule of thumb I usually won’t draw past than the end of my brow. Bright colors are a fun way to mix it up without overwhelming your eyes. A rule of thumb: Dark eyeshadows and light-toned sparkly eyeshadows both make my eyes looks smaller so I avoid using them in high concentrations. I also usually stick to just one color at a time because it’s obviously harder to blend when there’s no crease to mix the colors into. 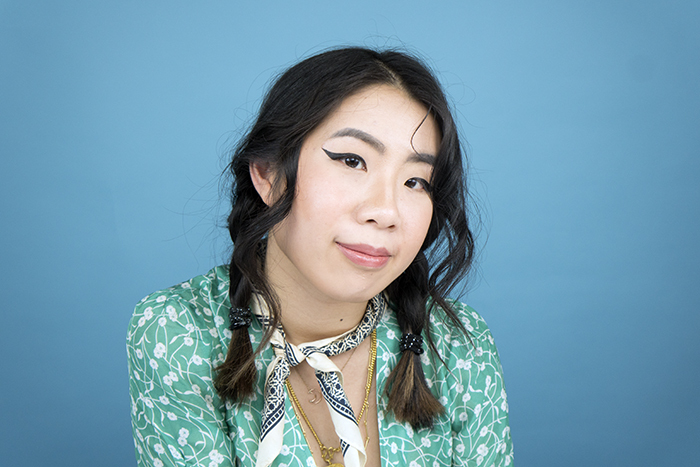 I’ve found that looks that are meant to emphasize or create a sense of shadow and depth come out looking fake and silly on monolids. 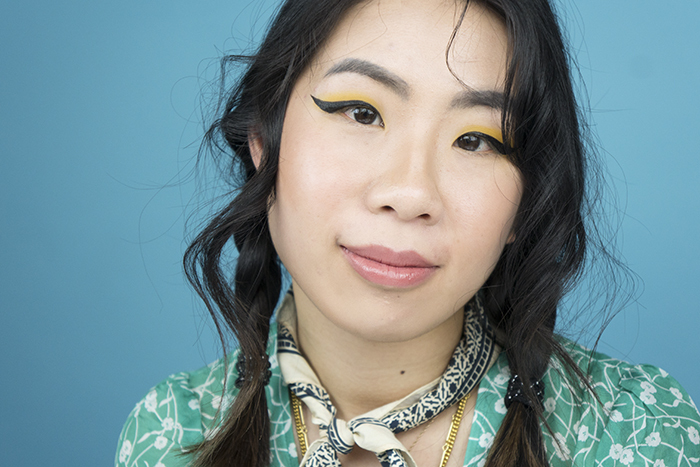 My go-to color is a bright yellow from the Lime Crime Venus II Palette and the Sephora Collection Eye Shadow in Yellow. I like it because it’s relatively rare as far as eye looks go and it’s such light color that perfecting a shape isn’t so important. If you’re a little bit messy like me, this gives you leeway on creating even eyes. But if yellow isn’t for you, it’s easy to find colors that work for your skin tone and wardrobe. I would check out bright pinks, oranges, reds, or even a chartreuse. 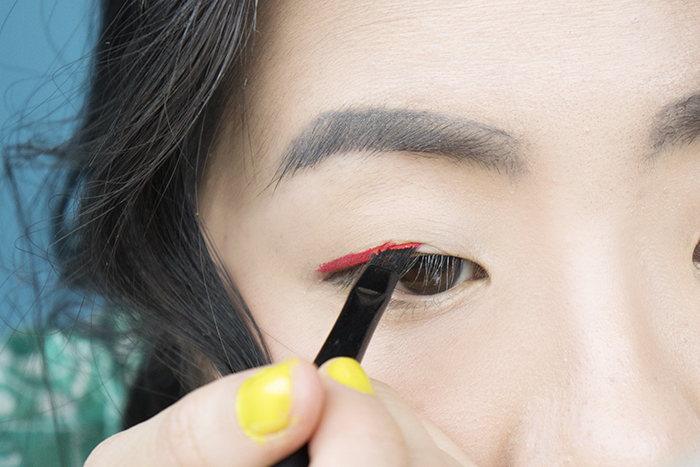 Another good way to incorporate color into your routine is to try colored eyeliner! 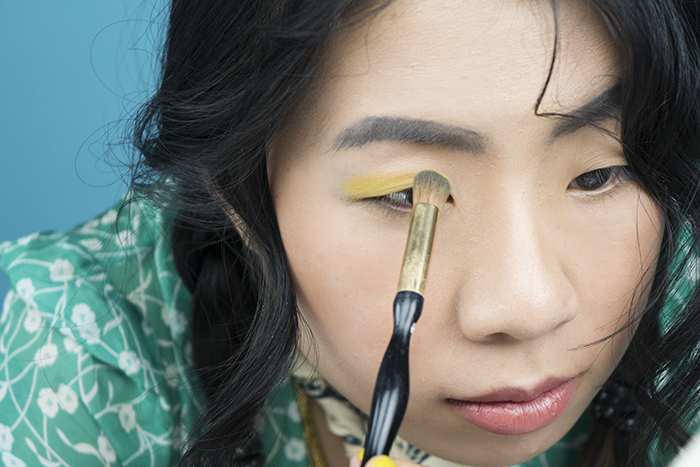 If you become bored of creating single colored eyeshadow looks mix it up with eyeliner in an unexpected color. My favorite is the Make Up Forever Aqua XL Color Paint Shadow in red. I just squirt a little bit onto the back of my hand and use a brush to create a wing the same way you would with a gel eyeliner. This line also has a bunch of fun colors to fit whatever mood you’re in for the day. If you don’t want to buy a new product you can still try this look with products that you probably already own. Liquid lipsticks are a great alternative. 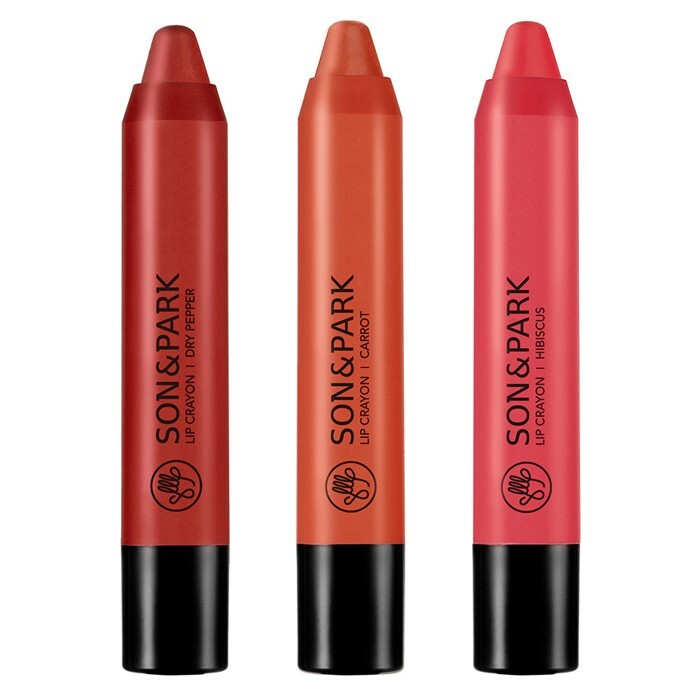 They dry down to a matte finish and come in a variety of colors that make it easy to mix and match. 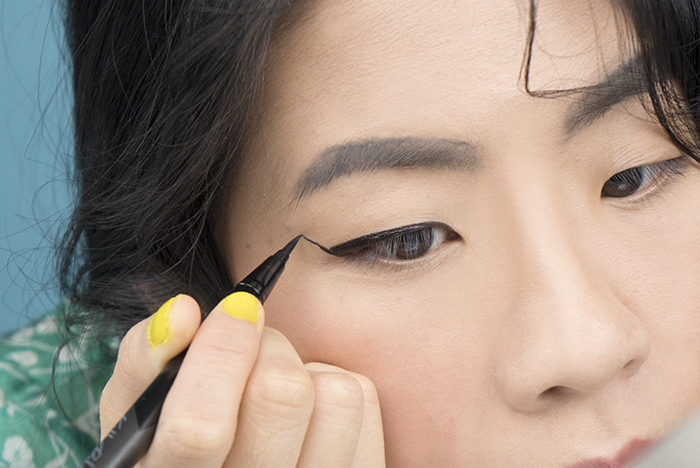 Use a pencil or a gel eyeshadow! Powder eyeshadows are super hard for me to use. Because I have such flat monolids, whatever mistakes and imperfections I make while shaping and blending become readily apparent during wear. Using a pencil or a gel gives me another level of precision during application and makes the blending so much easier. Just make sure to wear an eyeshadow primer underneath because these move around really easily without one. My favorite is the Sephora Collection Colorful Shadow and Liner in Call Girl and the Son & Park Lip Crayon in Orchid Purple (which I’m using in the photos). 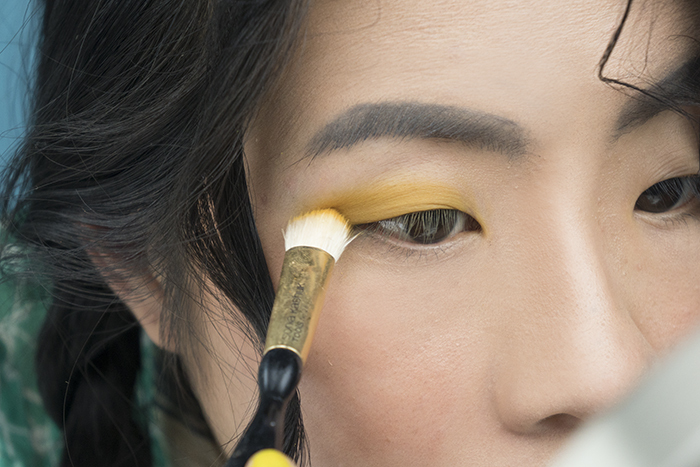 To apply I’ll usually just use my finger to blend because it allows me move the product around more easily. This technique also helps me better feel the shape of my eye. 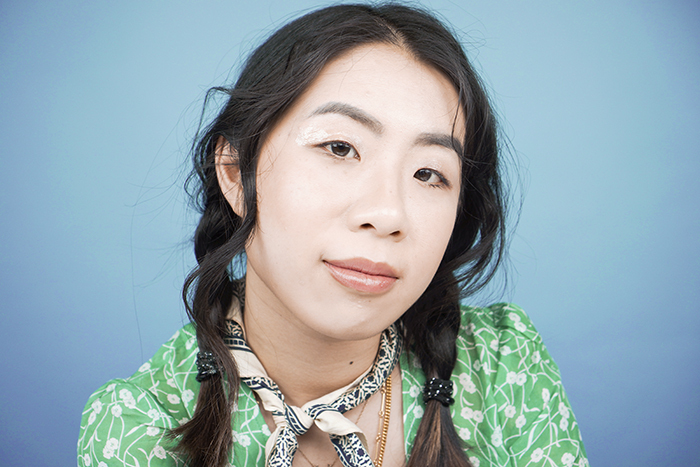 The eye gloss look was practically made for monolids! Why? No stickiness, no transfer, and no creasing. It’s a really fun low maintenance look if you wake up late and have to get out the door without putting on makeup. 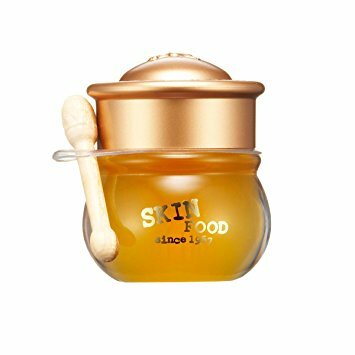 I always keep the Skinfood Honey Pot in my bag and will just swipe some on in transit to look a little more put together. If you have time and want to try this look, curl your lashes and add some mascara on top! 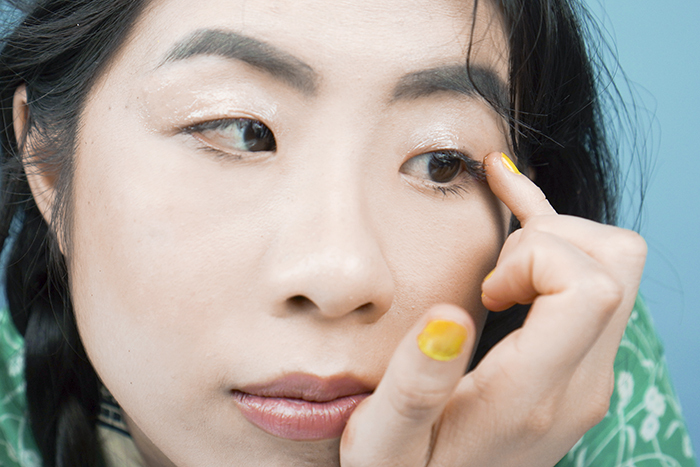 The common story around growing up with monolids is plagued by self-loathing. Like so many other people, I grew up hating my eye shape. These are some of the tips and tricks that helped me learn to love them. I may never be able to pull off the kinds of looks that overwhelm YouTube and Instagram, but I can do so much more! If you’re reading this, then the likelihood is that you have similar eyes to mine and I wish you all the best on your eye look journey! + What’s your best tip for makeup for monolids? Share with us below!